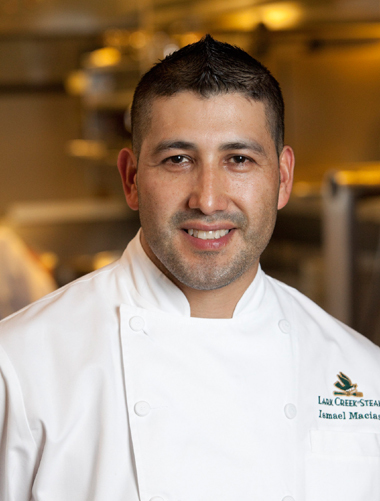 Ismael Macias’ path to becoming the new head chef at LarkCreekSteak in the swank downtown Westfield San Francisco Centre was anything but smooth. Hired as a dishwasher at sister restaurant, One Market in San Francisco, when he was in his mid-20’s, Macias quit after two weeks because the work was just too grueling. And that’s saying a lot, given that the now 36-year-old Macias has been working since he was 6 years old. One of 14 kids born to a family in Mexico, he immigrated to the United States at age 25 without knowing any English. For years, he worked two jobs while going to school. The folks at the Lark Creek Restaurant Group must have sensed his potential. They kept calling him to come back to work. Again and again. All told, they hired him, only to have him quit yet again — a total of seven times. Lucky seven it was, though, as Macias returned to One Market, where he worked his way up to become a line cook, then sous chef. Last year, he came on board at LarkCreekSteak, where earlier this spring, he was named its head chef. “My Mom cried when I told her that I got the job,” he says. It’s one thing when a restaurant has a great story to recommend it. But what’s on the plate still has to be worth walking through the doors. In both cases, LarkCreekSteak delivers. Recently, I was invited in as a guest of the restaurant to try the menu under Macias’ direction. Soft jazz plays on the sound system in the dining room, warmed with maple and blonde wood, large framed images of squash and wheat, and servers decked out in stylish yet laid-back navy striped shirts and black pants. Buttermilk biscuits (three for $2.50) get a most decadent treatment here. 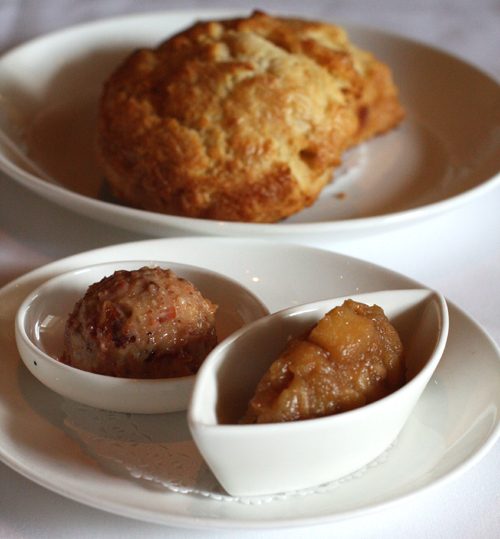 The big, buttery, crumbly biscuits arrive with two accompaniments: sweet, fruity pear-apple compote and andouille sausage-maple-pecan butter. Yes, you read that right. Butter laden with bits of smoky sausage, maple syrup and crunchy pecans to smear all over. The mind reels. But it’s no match for the stomach that calls out for more, more, more. 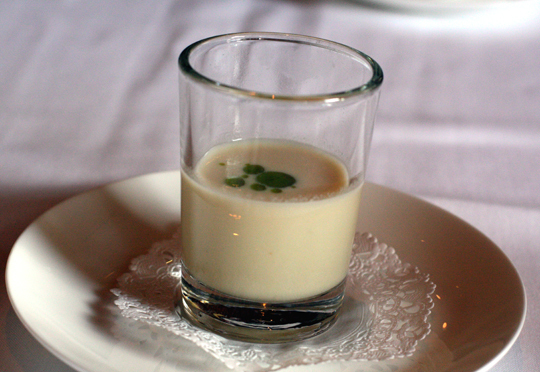 An amuse of warm corn soup arrived that was stunning. It didn’t look like much in the shot glass, but one sip had my eyes virtually popping out of my head with its intense corn flavor that was the essence of summer. Next, what might just be the best California roll ever. It was not your usual seaweed roll encasing fake crab and rice. 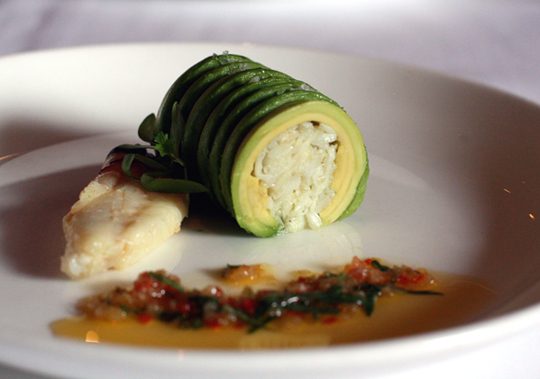 Instead, a perfect cylinder of avocado with ridges like Thanksgiving cranberry sauce out of a can was stuffed — and I mean stuffed — with real-deal Dungeness crab. A lively pool of jalapeno vinaigrette lay on the side for added kick. 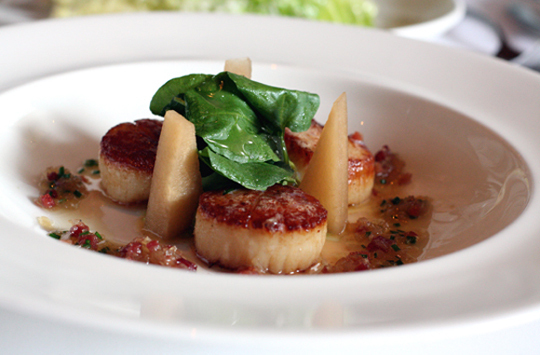 Beautifully crusted, plump day-boat scallops ($16.95) were bedazzled with avocado puree and bacon vinaigrette. Triangles of crunchy, perky pickled jicama helped cut the richness of the dish. 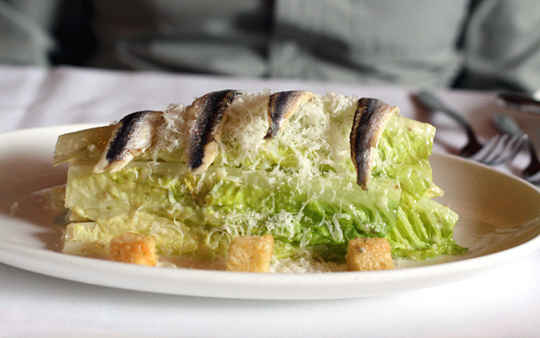 Bradley’s Caesar Salad (named for founding chef, Bradley Ogden, $9.95) is a can’t-miss. Whole-leaf romaine is lightly dressed. 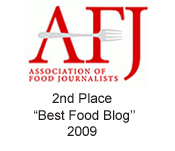 And like any great Caesar, there were anchovies — white ones that had a more pickled flavor than overt saltiness. 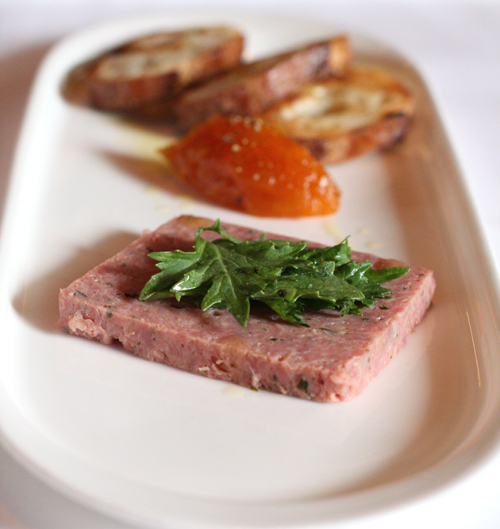 A rustic, chunky-textured slab of duck terrine was garnished with sticky, thick apricot-ginger compote. Spread thickly on toasted bread, it made you long for a picnic in the French countryside. My husband couldn’t resist his favorite cut of beef — a 28-day, dry-aged prime ribeye ($47.95) that was buttery and oh-so-beefy. Hand-cut fries ($7.95) are perfect planks here, arriving to the table still piping hot. 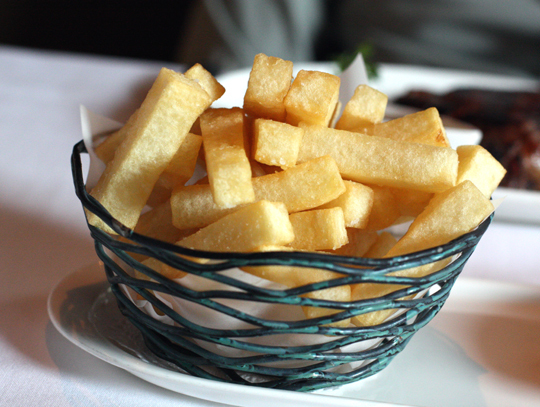 The neat, uniform shape of the fries means you get to enjoy a high ratio of creamy, almost custardy potato flesh. 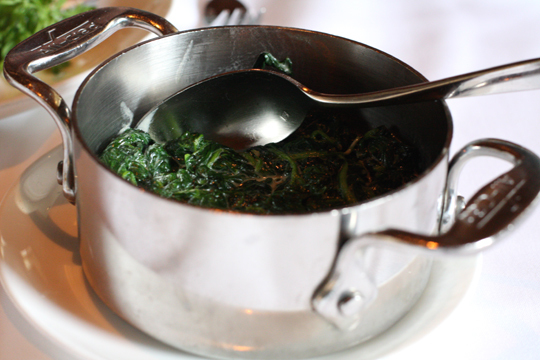 Creamed spinach gets a much needed makeover. It’s still creamy, but lightly so, letting the minerality of the spinach still shine through. 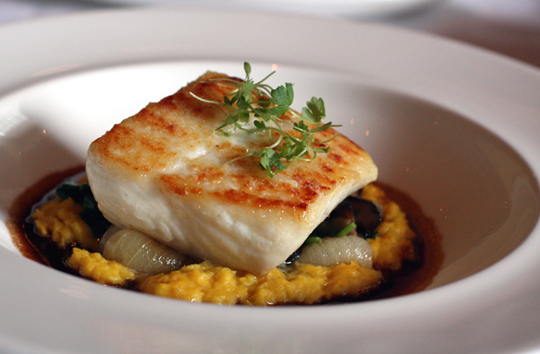 Like all the Lark Creek Restaurant Group establishments, LarkCreekSteak serves only sustainable seafood that gets the seal of approval from the Monterey Bay Aquarium’s “Seafood Watch Guide.” Roasted Alaskan halibut meets that criteria. The natural sweetness of its moist, white flesh was amplified by the fresh corn polenta it lay atop. For a light, refreshing end to the meal, you can’t go wrong with the restaurant’s seasonal sorbets ($7.50). 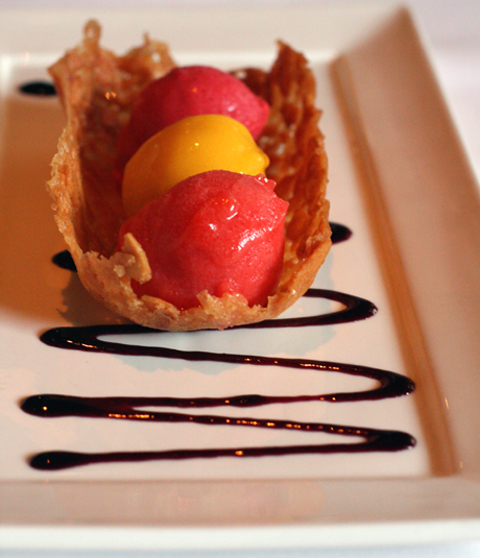 That night, the selection included strawberry, mango and raspberry — mounded into a crisp almond tuille. 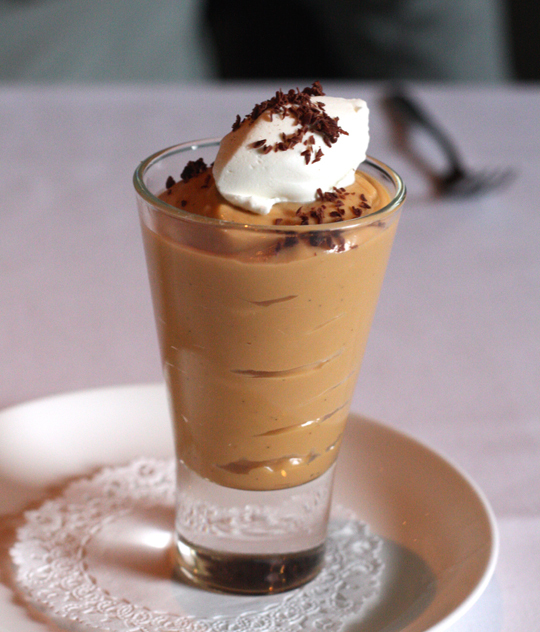 But if you’re like me, there’s one dessert you simply cannot ever pass up: “Famous Butterscotch Pudding” ($7.50). Yes, “famous” is actually part of its name. 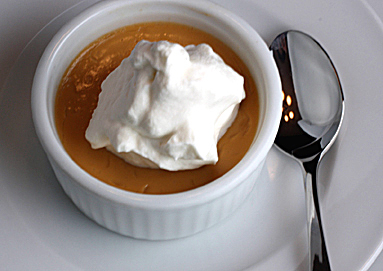 One spoonful of this very dense, creamy pudding made with real scotch and you’ll know why it’s a staple on all Lark Creek Restaurant menus. Like Macias, who kept getting pulled back in to work at the restaurant, the flawlessly executed food and the glorious pudding will keep luring you back to LarkCreekSteak. Again and again. Anytime you start a post with a photo of dessert, I’m instantly hooked 😉 What a great story about Macias! A beautiful meal! 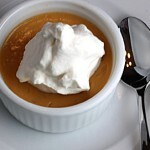 I love the sheer simplicity and refinement of each dish. I love that place! You need to try the steakburger! Cookie: Oooh, steakburger? My hubby, aka Meat Boy, would be all over that. I guess it goes to show that perseverance pays off! And man, all that food looks good. I especially want that butter sausage maple mix. 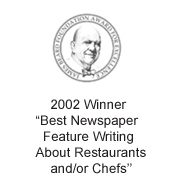 You’ve successfully added another restaurant to our “must try” list. Thanks Carolyn! Every dish at this restaurant looks awesome – perfectly seared scallops and how in the world did he do that avocado?? 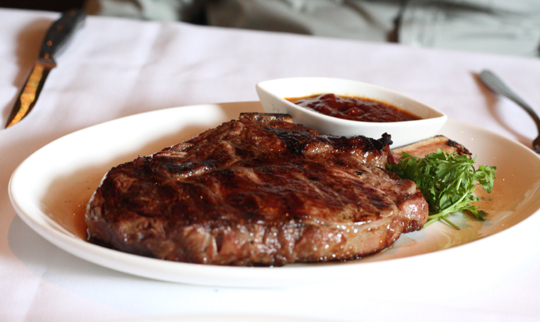 I’m definitely with your hubby as I would have ordered my fave rib eye too – it looks perfectly cooked and well rested. I love when restaurants present meat that way – no fuss and whatever condiments, tapenade, sauces or mustard should be separate and on the side! What a wonderful success story and it only goes to show where gumption and passion can lead you, right? And his food is stunning! It all looks so simple yet so thought out and super delicious! Wish I lived close enough, this would definitely be a restaurant I would try! Wow – this post had me proclaim “Yes!” out loud 13 times, with the loudest yeses for the California rolls, ribeye and fries, sustainable halibut, the butterscotch pudding, and Ismael’s wonderful story. Oh Wow! What an array of great looking plates of food! 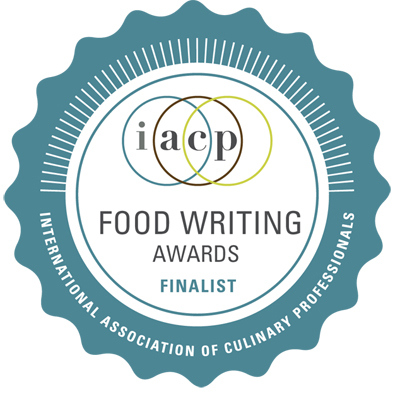 I love the chef’s story; what an inspiration. Thank you for sharing this post. The food saga is only topped by the uber-inspiring story of Chef Macias! Sounds like tenacity personified. Great reasons to check out this place immediately; thanks for sharing this story.